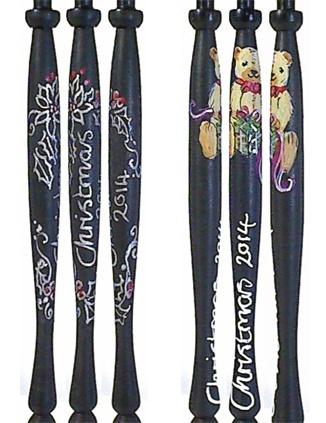 Each year I have a number of Christmas designs beautifully hand painted by Sue Edmond who has painted my Christmas Bobbins for a number of years. Design 1: Silver Christmas Design. Styles available are:- Continental , 11mm Flanders, Binche, Bayeux, Long Square, Short Square, International Square & Downton.